It won a prize for adobe appbox 2013 utility. Over 2,000,000 users love this app. No.1 sweet/kawaii camera app in Japan, Hong-Kong, Taiwan. 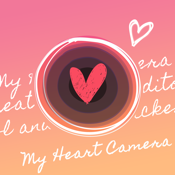 Let's decorate your photo lovely with hearts ! Your photo is decorated automatically! You can use new hearts set! You can decorate your photo with many heart stamps that are very cute and sweet. You can use photo Filter Effects like Instagram. Once you bring a device close to your heart for 3 seconds, photo will be decorated automatically. It's amazing! Let's try it now! After decorating your pictures, you can post your image on Facebook, Twitter, Instagra, Tumblr, LINE, etc... Share with your friends and family! Decorate your fotos lovely now! !